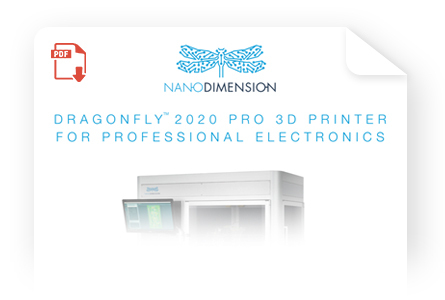 Nano Dimension's DragonFly 2020 Pro 3D printer is a highly accurate and versatile inkjet deposition and curing system for printing professional multilayer circuit boards. The DragonFly 2020 Pro 3D Printer represents an evolution unlike anything the industry has seen before. The innovative hardware, dedicated nano-inks and novel software offers virtually limitless design flexibility to a wide range of research and development, prototyping and custom manufacturing projects. Video: Nano Dimension has developed a PCB 3D printer and a suite of nanotechnology conductive and dielectric inks specifically for PCB professionals, enabling the ability to take full control of PCB development and shortening time to market. The DragonFly 2020 Pro 3D Printer is a one-stop solution for 3D-printed electronics. Move quickly from concept verification and design validation, to test fixtures by 3D printing your own professional circuit boards. The rapid prototyping capabilities of the DragonFly 2020 Pro 3D Printer for professional 3D printed electronics completely transforms the ways product development teams work. No more waiting days or weeks for a custom PCB prototype that has to be fabricated offsite. The DragonFly 2020 Pro 3D Printer offers the flexibility to print an entire board or just part of a circuit. You can develop the RF and digital sections of the board in parallel, test and iterate on the fly. The DragonFly 2020 Pro 3D Printer empowers progress and encourages innovation, lessening development risks and enabling faster times-to-market - and ultimately, better products.